Fans of SNICKERS will love the taste of the new SNICKERS Shake. This delicious treat matches the chocolate bar’s combination of sweet caramel, nougat and chocolate combined with the distinctive salty twist from real roasted peanuts. SNICKERS Shake is available in Tesco, Tesco Express, Asda, Morrisons. RSP 2 for £2. Capturing the unmistakable taste of SKITTLES, the new SKITTLES Shake let’s you taste the rainbow in liquid form. The fruity milk drink is bursting with flavour, making it the perfect drink to get you in the mood for summer. 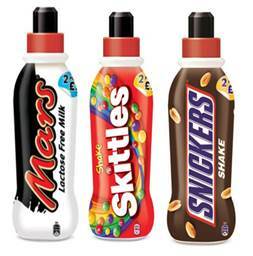 SKITTLES Shake is available from Tesco and Morrisons. RRP 2 for £2. You can now enjoy the famous taste of MARS Milk, the UK’s number one chocolate milk drink*, without the lactose. The new milk drink is perfect for individuals who are lactose intolerant or who just wish to avoid it. What’s more, MARS Lactose Free Milk is an excellent source of protein and contains no artificial colours, preservatives or sweeteners. Best of all, the latest addition to the MARS Milk range is low in fat without compromising on the delicious, creamy flavour of MARS Milk. MARS Milk Lactose Free is available in Asda and Morrisons. RSP 2 for £2.